1 of 3 Bring a large pot of salted water to a boil. Add soba noodles and cook 3 minutes. 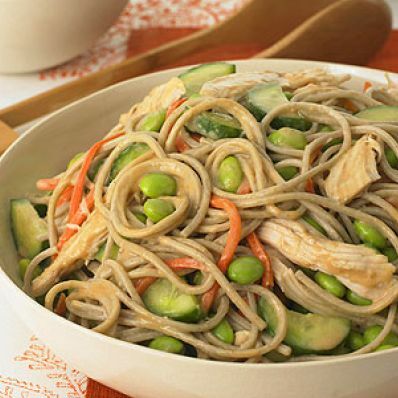 Add edamame and carrots to noodle water and cook 3 minutes more. Drain. 2 of 3 In a large bowl, whisk together peanut butter, salad dressing, and 1/4 cup very hot water. Add drained noodle mixture to peanut sauce and toss to coat well. 3 of 3 Add chicken and cucumber slices and toss again. Serve warm or at room temperature. Per Serving: 7 g fiber, 24 g Fat, total, 35 g pro., 62 g carb., 585 kcal cal.